This pattern employs an ingenious slip stitch pattern to create a sophisticated plaid. Three sizes are offered ranging from 37 to 44 inches (94-111.8cm) finished bust measurement including about 4 inches of ease. A schematic provides detailed measurements. -You will need 900-1200 yards (~825-1101 meters) of the main color and 500-700 yards (~460-642 meters) of a second color. A medium weight yarn (#4) is suggested. 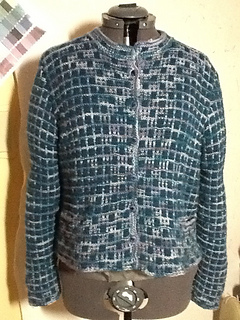 The illustrated sample uses a solid for the main color and a variegated yarn to create the lines of the plaid. A 24 inch circular needle is suggested. Eight buttons are also required and the usual assortment of stitch markers and holders. You will also need a 4mm/US size F crochet hook. 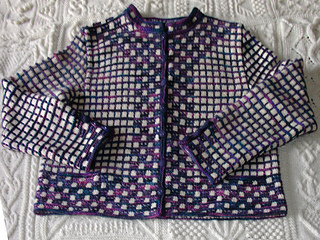 Described as an advanced pattern, the jacket is body is knit flat in one piece. Sleeves are knit flat. Seams are joined with a crocheted slip stitch. 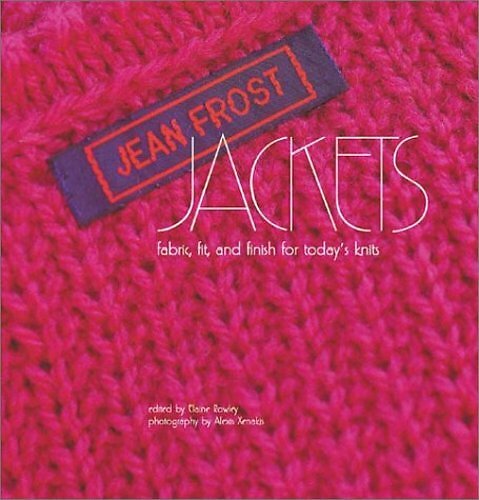 The stitch patterns are both described in words and written out. Placement of the motifs is shown by charts.